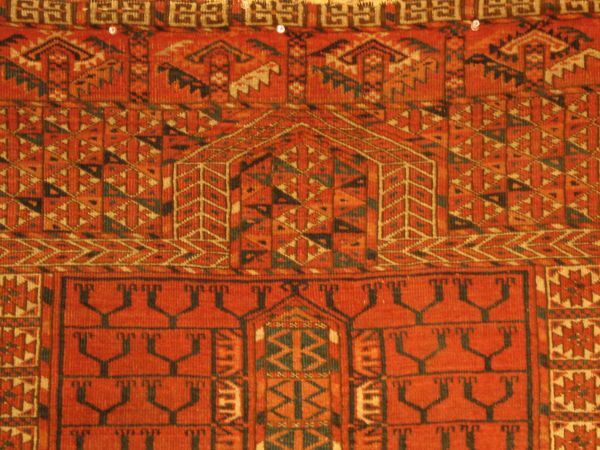 The presence of the natural insect dye Cochineal is an important indicator when dating Turkmen carpets. 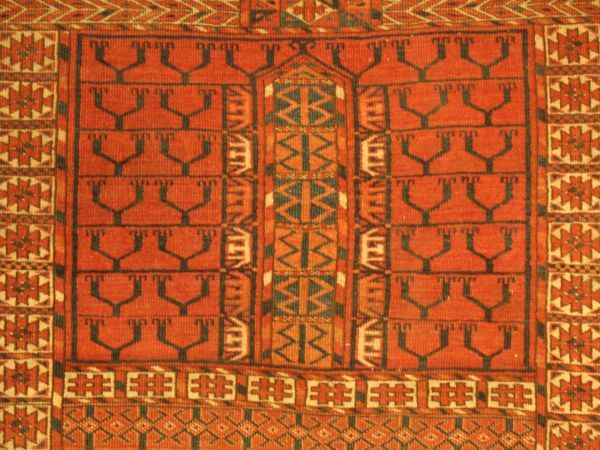 The presence of a corrosive Cochineal dye (Cochineal I, Whiting, from the T.M's "Turkmen") indicates an earlier date, while the presence of "hard" or non corrosive Cochineal dyed wool, indicates a mid 19th century or later date. 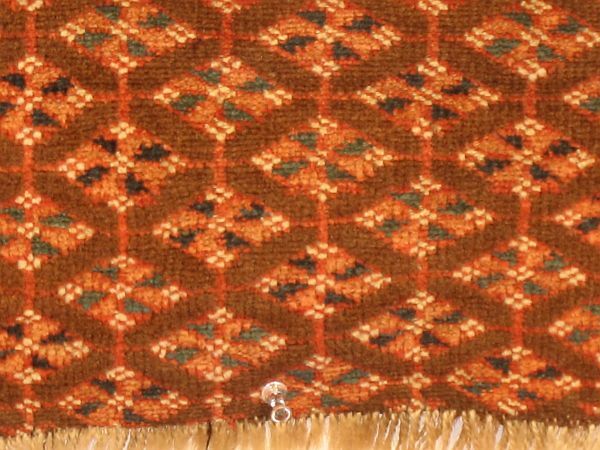 The Cochineal in this engsi is used as a special material, limited to highlighting in the cross bar and some of the adjacent Ashik devices. 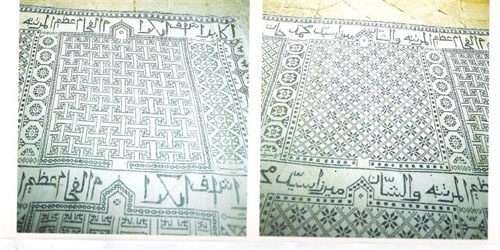 While there is both a strong similarity to the Persian Zilu flatweave in regard to pattern and a history of their being regarded as prayer rugs,the Turkmen Engsi is at present consensus regarded as a yurt "door" rug or curtain,which was most probably used during special occasions or displayed inside the yurt as a votive. The Turkmen made large numbers of these engsi, and especially the Tekke Turkmen, of which the engsi above is an example. 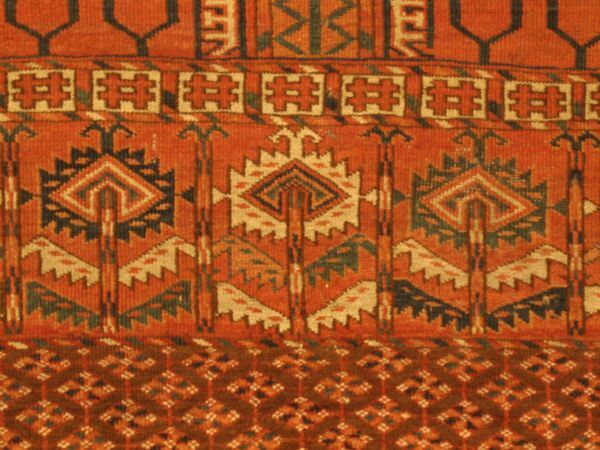 That so many examples exist render it relatively easy to date tekke engsi, and the lack of synthetic dyes (per R. Pinner in "The Rickmers Collection") dates this example to before 1880. Zilu from Parviz Tanavoli's "Persian Flatweaves"
special material would move it's date of production near the mid nineteenth century mark. There seems to emerge a dichotomy in regard to size of engsi. Those of a wider and those of a more narrow format. R John Howe, in his Turkotek Salon entitled "What Can We Say About the Engsi?" explored the relationships between width and length within the two respective classes, and arrives at the tentative conclusion that "Engsis that are estimated to be older do seem often to be narrower". R. John Howe :"What Can We Say About the "Engsi?" dimension. One follows the other. 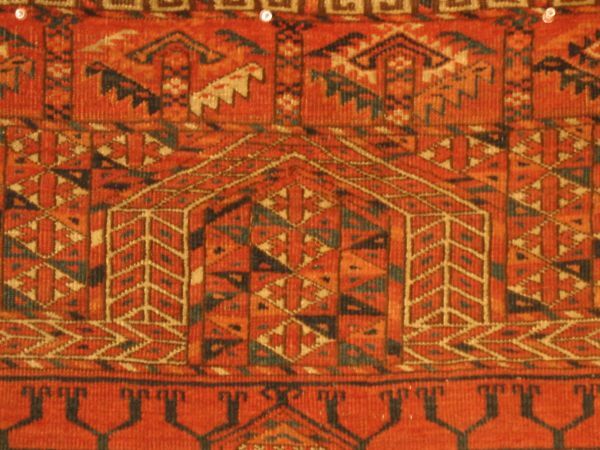 This Tekke engsi does fit within the dimensional parameters of which R.John Howe denotes as being of the narrow format and hence of a door rug. 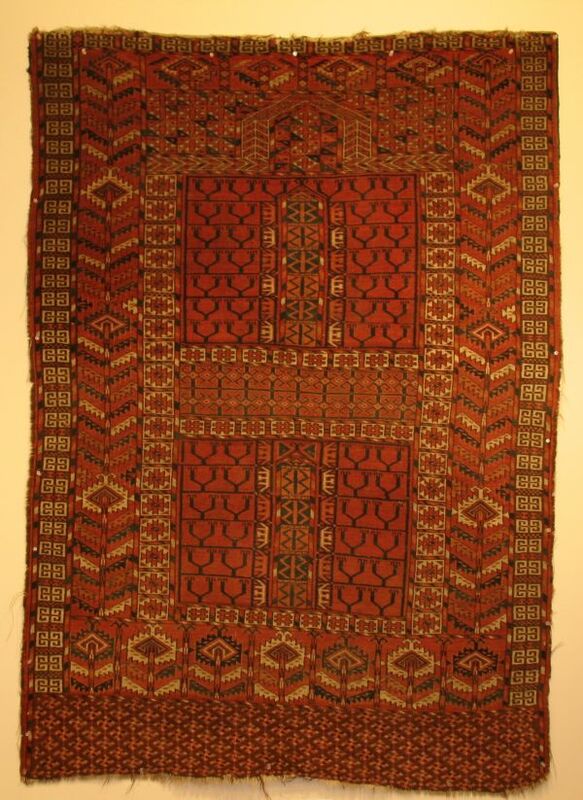 This engsi seems possessed of several attributes worthy of mention, which taken as a whole seem to indicate that this engsi was indeed produced during the mid-nineteenth century for use as door rug within a tribal setting. In the first instance, the aforementioned parameters indicative of the door rug format. ground and both the the greens and yellow point to an earlier date before the introduction of synthetic dyes. lot of white to lighten the composition and harmonious pairing of color to a most pleasing effect. This speaks to a familiarity with color and hence a mature,sophisticated use of these colors, well within the traditional usage. which may not seem immediately apparent, but slowly asserts itself as a primary theme in the composition. distinct qualities demonstrated by the weaver, that of a masterful command of and familiarity with the drawing of the individual components or elements used in the composition, and a spontaneity which allowed an informal lay out of the base composition, which resulted in the engsi's irregularities and attendant idiosyncrasy. The informal layout is best demonstrated by the width of the column of trees on the left side of the composition, which is considerably wider, by half an inch, than that of the column on the right. This difference in width throws off the centering of the entire composition, yet the weaver took it in stride, and seemed to effortlessly compensate for these discrepancies with her command and understanding of the constituent elements, shortening, filling and compressing elements where deemed necessary. Yet for all of this shortening, filling and compressing of the constituent elements, the weaver was enabled to articulate this sublime mihrab. 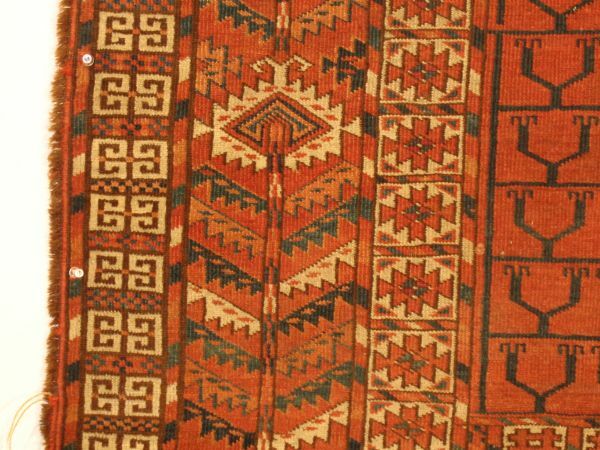 The arch,of which appears to be a delicate and sophisticated rendition of a form of embroidery, commonly found upon the Tekke Chyrpe, is the most exquisite that I have seen on any Turkmen engsi. which acts as a backdrop to the arch, guiling one's perception of depth. This central row of "dog bones" located within the mihrab effectively draws one's attention away from the fact that the "dog bone' field is considerably shortened to the right.